Filling a house with furniture is part of what makes it feel like a home, and adding pieces such as Amish tables can create such a warm, attractive and unique look. Of course, when one thinks of Amish tables you may be trying to decide which areas of the home could use pieces like this. 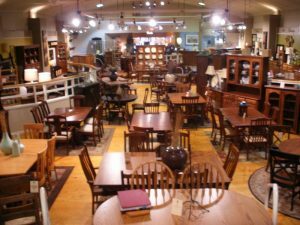 The great thing is by shopping with the right dealer of fine Amish furniture you can find everything from tables to home office pieces to individual accent pieces. Choosing Amish Originals means being able to get all your home furnishing shopping needs done in one place. There are possibly more selections for tables when shopping with Amish Originals than you could probably imagine. For instance, you may need that all-important dining room table where the entire family and guests gather for Thanksgiving dinner. Maybe what you are looking for is more of something to complete the living room such as a coffee table, end table or sofa table. How about a night table for the bedroom or an accent table to display your favorite decorative pieces? Whatever the need as well as whatever the look, you can find the perfect table for your home at Amish Originals. Not only do we offer the selections you want but also the customized choices you need to make these pieces your very own. Choose the wood and the finish to create the look that matches your home as well as your personality. Not only do we offer Amish tables, we offer a variety for each room you could need to furnish. So when you shop Amish Originals Furniture Company for tables, you do not just choose between a dining room table or a coffee table. Just within the Amish dining room tables you could choose from a wide variety of leg tables or pedestal tables. If nothing in either of those two subcategories catches your eye, there’s still all the selections in the trestle tables or the pub tables. From there you still customize your wood and finish and then the handcrafted workmanship begins. Each piece is built to order so you know you are getting a one of a kind original. Each piece gets the classic and time-honored treatment only generations of Amish families can pass down and share with each other. You are not likely to find anything that comes close to touching the detailing or the quality that goes into each piece. You certainly will not find anything that beats the beauty, hand craftsmanship or the quality wood used to make every single piece of furniture you will find at Amish Originals. Choose from the finest American hardwoods such as Oak, Cherry, Hickory, Maple and Quarter Swan White Oak. Wood that can stand the test of time and add such a rich and alluring look to your home. These Amish tables really are crafted from the best wood and with the ultimate craftsmanship to make your house feel like a real home.